374 Marlborough is located on the south side of Marlborough, between Hereford and Massachusetts Avenue, with 372 Marlborough to the east and 376 Marlborough to the west. 374 Marlborough was designed by Kirby and Lewis, architects, and built in 1880 by Silas W. Merrill, builder, as the home of wool merchant Albert Ellis Harding and his wife, Mary Manzer (Clark) Harding. They were married in 1880 and 374 Marlborough probably was their first home together. Prior to their marriage, he had lived at at 118 Commonwealth with his parents, William H. Harding and Elizabeth (Hicks) Harding. Albert Harding is shown as the owner on the original building permit application, dated February 17, 1880, and his mother, Elizabeth Harding, is shown as the owner of the land. She purchased the land on January 9, 1880, from Grenville T. W. Braman, Henry D. Hyde, and Henry M. Whitney, trustees of a real estate investment trust that had purchased several parcels of land on March 1, 1872, from the Boston Water Power Company. Click here for an index to the deeds for 374 Marlborough, and click here for further information on the land on the south side of Marlborough between Hereford and Massachusetts Avenue. Albert and Mary Harding continued to live at 372 Marlborough during the 1888-1889 winter season, but were living elsewhere during the 1889-1890 season, and 374 Marlborough was the home of Edward Everett Parker, an ice dealer, and his wife, Laura (Eddy) Parker. 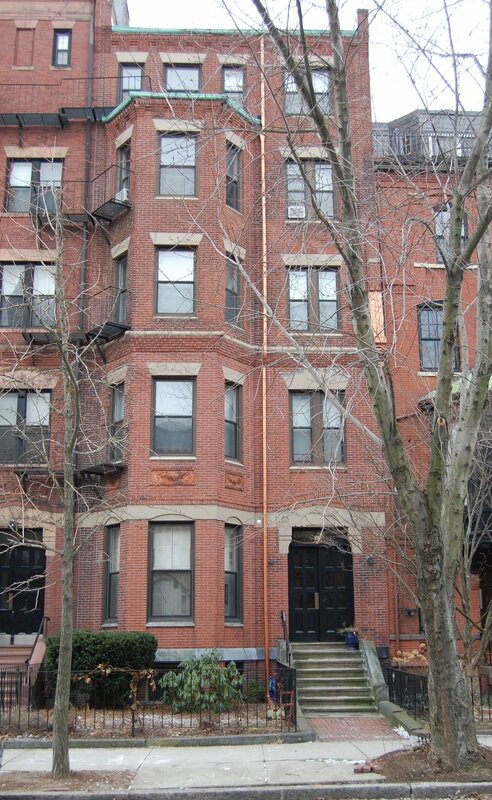 By the next season, the Parkers had moved to 154 Newbury and 374 Marlborough was once again the Hardings’ home. Albert and Mary Harding continued to live there during the 1894-1895 season, but moved thereafter and by 1897 were living at 137 Bay State Road, which also was owned by his mother. On May 15, 1895, 374 Marlborough was purchased from Elizabeth Harding by Ella Bradley. She lived at 374 Marlborough with her father, Rev. William Bradley, a widower, and her two sisters, Anna and Mary Bradley. They previously had lived in Jamaica Plain. William Bradley was a Unitarian minister and had served as pastor of the Union for Christian Workers in Boston from 1873 to 1893. His daughters were teachers and, by 1907, they were operating a private school, the Bradley School, at 374 Marlborough. Rev. Bradley died in May of 1909. The Bradley sisters continued to live and operate their school at 374 Marlborough. They also maintained a home in East Lexington. By 1909, they had begun to lease a portion of 374 Marlborough as medical offices. On December 26, 1911, Ella Bradley transferred the property to her sisters. She died in April of 1912. Mary and Anna Bradley continued to live at 374 Marlborough (and to rent offices to physicians) through the 1913-1914 winter season, but moved thereafter. 374 Marlborough appears to have been entirely medical offices from 1914. On July 14, 1916, 374 Marlborough was purchased from Anna and Mary Bradley by Dr. Walter J. Dodd. He was a pioneer radiologist, the founder of the radiology department at Massachusetts General Hospital. Walter Dodd and his wife, Margaret (Lea) Dodd, remodeled 374 Marlborough to be their home and his medical office. They previously had lived (and he had maintained his medical offices) at 205 Beacon. Dr. Lawrie Byron Morrison, also a radiologist and the founder of the radiology department at Deaconess Hospital, maintained his office at 374 Marlborough with Dr. Dodd. He also had maintained his offices at 205 Beacon the previous year. Dr. Morrison and his wife, Fannie Stella (Rowe) Morrison, lived in Roxbury and later in Brookline. Walter Dodd died in December of 1916, the victim of injuries resulting from his work with radiation. Margaret Dodd continued to live at 374 Marlborough. Her unmarried sister, Elizabeth Eleanor Lea, lived with her in 1920. In July of 1919, Fannie Morrison purchased 370 Marlborough. Lawrie Morrison converted it into medical offices and moved his office there from 374 Marlborough. They continued to live in Brookline. By the 1920-1921 winter season, Margaret Dodd had been joined at 374 Marlborough by Dr. George Arthur Craigin and his wife, Louise Gray (Fraser) Craigin. They previously had lived at 18 Hereford. He was a physician and maintained his offices at 374 Marlborough. Also living at 374 Marlborough by 1922 was Dr. George Warren Bachman, an orthopedic surgeon. He also maintained his medical offices there. Dr. and Mrs. Craigin continued to live at 374 Marlborough with Mrs. Dodd in 1923, but had moved to The Grosvenor at 259 Beacon by 1924. He continued to maintain his office at 374 Marlborough until about 1938. Margaret Dodd continued to live at 374 Marlborough during the 1925-1926 winter season, but moved thereafter to 41 South Russell. On December 30, 1925, 374 Marlborough was purchased from Margaret Dodd by real estate dealer James N. Ambler, who conveyed the property to a partnership of doctors, including Drs. Joel Ernest Goldthwait, Robert Bayley Osgood, Lloyd Thornton Brown, Loring T. Swaim, Philip D. Wilson, and Francis Cooley Hall. They also owned 372 Marlborough, where they maintained their offices. Dr. Bachman continued to live and maintain his practice at 374 Marlborough until about 1929; by 1931, he had moved to 19 Bay State Road. By 1930, 374 Marlborough was entirely medical offices. 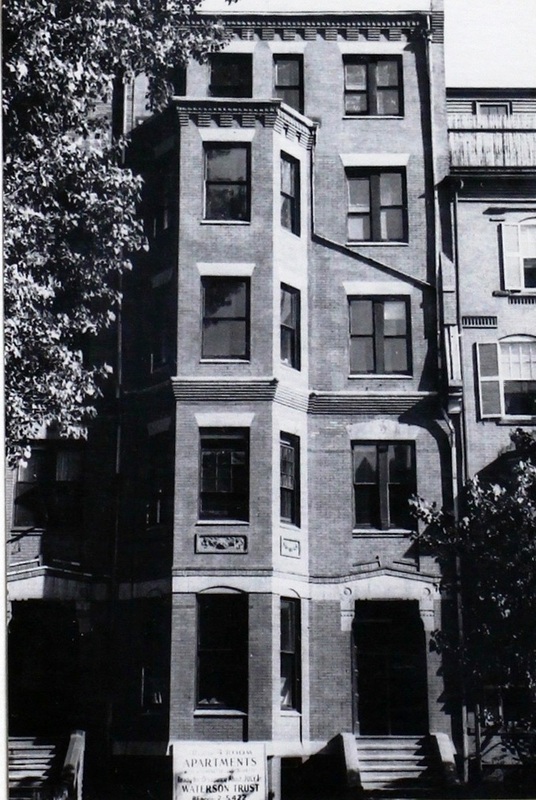 On December 31, 1930, the partners transferred 372-374 Marlborough to Marlborough St. Associates, Inc., which they had formed to hold the property. 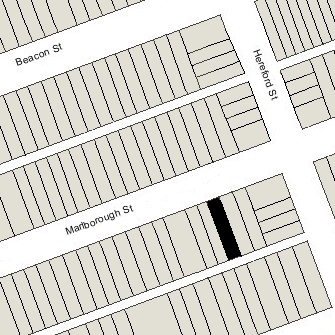 On March 16, 1948, 372-374 Marlborough were acquired from Marlborough St. Associates by real estate dealer Norman Lipson, trustee of the Mackay Realty Trust (conveyed by Gladys Farrell). In April of 1948, he applied for (and subsequently received) permission to convert the property from medical offices into five apartments. On December 1, 1948, 374 Marlborough was purchased from Norman Lipson by Thomas Constantin and his wife, Olga (Nagi) Constantin. They lived in Brookline. On May 10, 1957, 374 Marlborough was acquired from the Constantins by Pauline Asquith and Lillian E. Aarons. On January 2, 1959, 374 Marlborough was acquired from Pauline Asquith and Lillian Aarons by Stanley Allison of Belmont. In January of 1959, he applied for (and subsequently received) permission to legalize the occupancy as seven apartments, which he indicated was the existing condition when he purchased the building. The property changed hands and on September 6, 1961, was acquired by real estate dealer Francis Ralph Sundbergh and his wife, Julia (Abraham) Sundbergh. They lived at 92 Bay State Road. On June 5, 1963, 374 Marlborough was purchased from the Sundberghs by Robert White. On August 5, 1969, 374 Marlborough was purchased from Robert White by Keith John Cooper-Baines, a building contractor, and Mac Clanning Grant. On July 14, 1975, Robert White foreclosed on a mortgage from Keith John Cooper-Baines and Mac Clanning Grant, and took back possession of the 374 Marlborough. In December of 1988, he applied for (and subsequently received) permission to increase the number of apartments from seven to nine. On February 1, 1991, he transferred the property to Charles White Management, Inc.
374 Marlborough remained an apartment house in 2017.